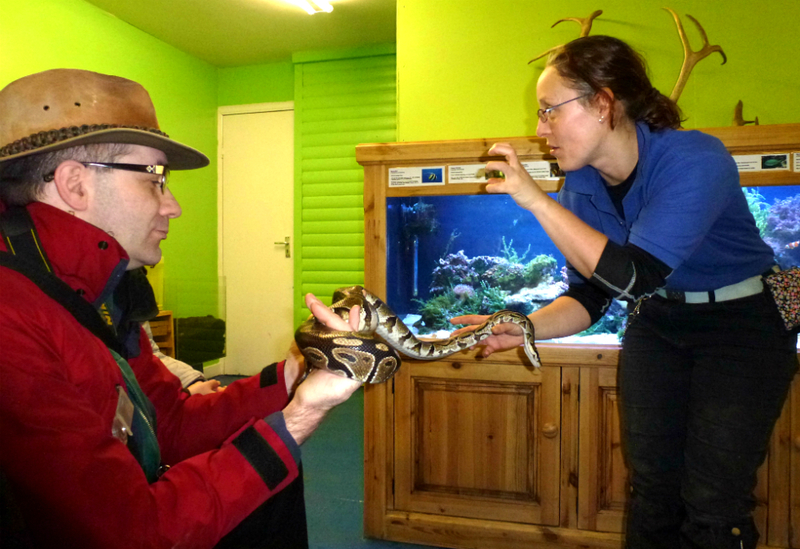 We were recently introduced to Five Sisters Zoo by Lisa and Andrea, an animal-loving couple we’re very good friends with. The zoo is significant for its focus on animal rescue. Its latest rescues are two bears who had been saved from a life of circus performance, and a lynx who had been living in a small enclosure at a rescue centre that could no longer provide for him. The zoo had gone to enormous trouble to build spacious naturalistic habitats for these animals. I approved of its sense of priority: it provides proper hiding places for every creature, and visitor visibility be damned. Thus the bears were out of sight, hibernating in underground hollows among the trees. Buster the lynx was wide awake, though. Here he is, looking a bit unsure of himself in his new surroundings. 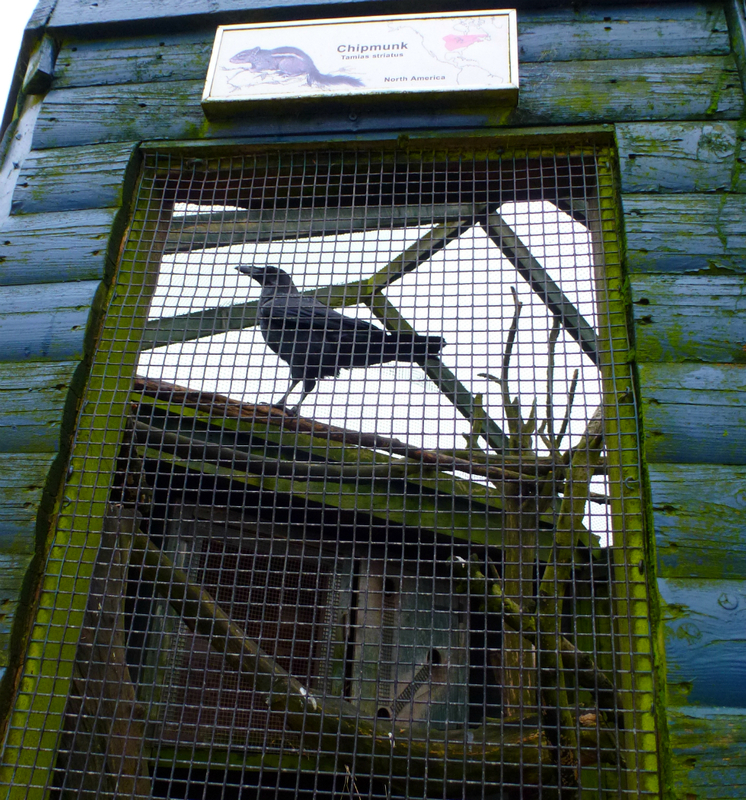 He had climbed to the top of one of his climbing frames in his woodland enclosure. The zoo owner told us he likes to watch the comings and goings in the car park from this vantage point. I blinked at him in the slow way that cats do to smile at each other, and he blinked slowly back. 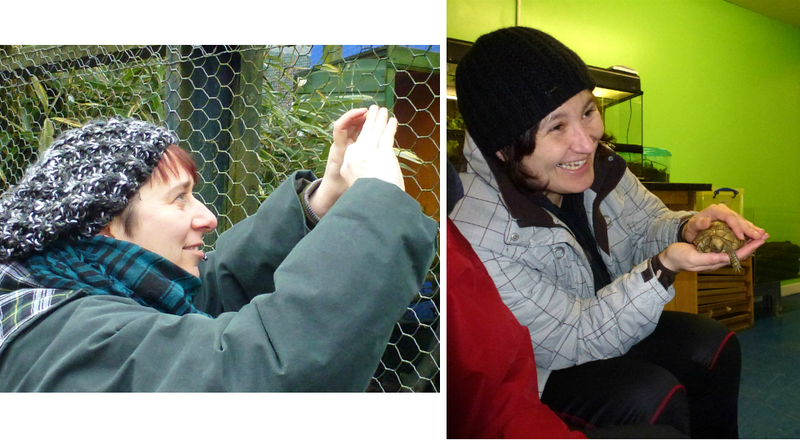 The more long-term zoo inhabitants were busy, happy and curious. 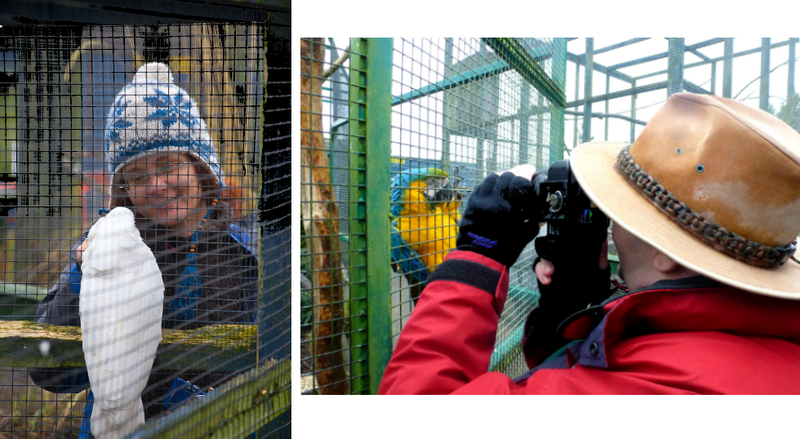 They enjoyed looking at the visitors and trying to poke us through the bars. 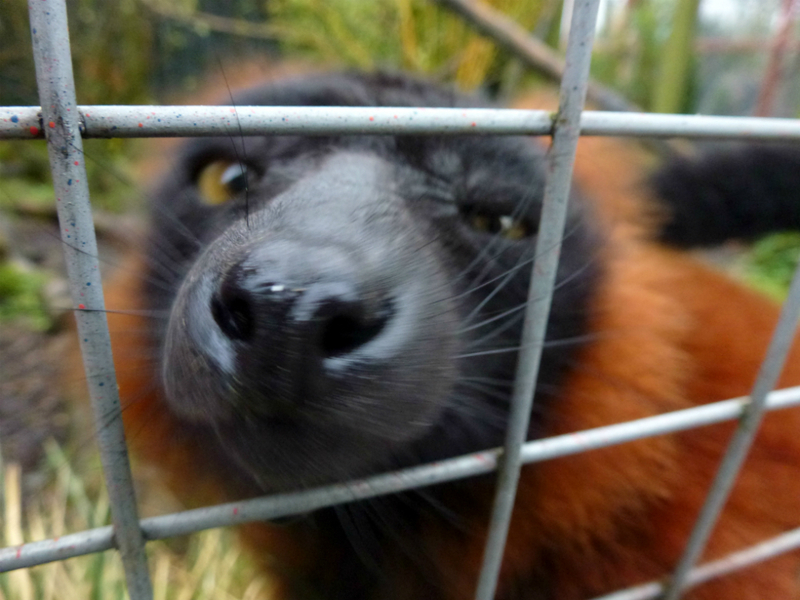 Various species of lemur tried to lick my camera lens, and this one succeeded. Some of the birds spoke to us with such charm, it was difficult to walk away from them. I loved the scents of the different animals: the foxy meerkats, the goaty-horsey reindeer, the lemony raven. The skunk was, sadly, snoozing in a hole, so I didn’t get to satisfy my curiosity on that score. Andrea adored the monkey house, particularly the tamarins who all crowded up to her, some of them hanging upside down, to scrutinize her closely. Lisa was immensely popular with all the animals, because she happened to be carrying a crackly bag. Animals have a special affinity for crackly bags. One otter went berzerk, rushed around squeaking, then climbed to the top of a tree and loudly berated her for not sharing her tuna sandwiches. 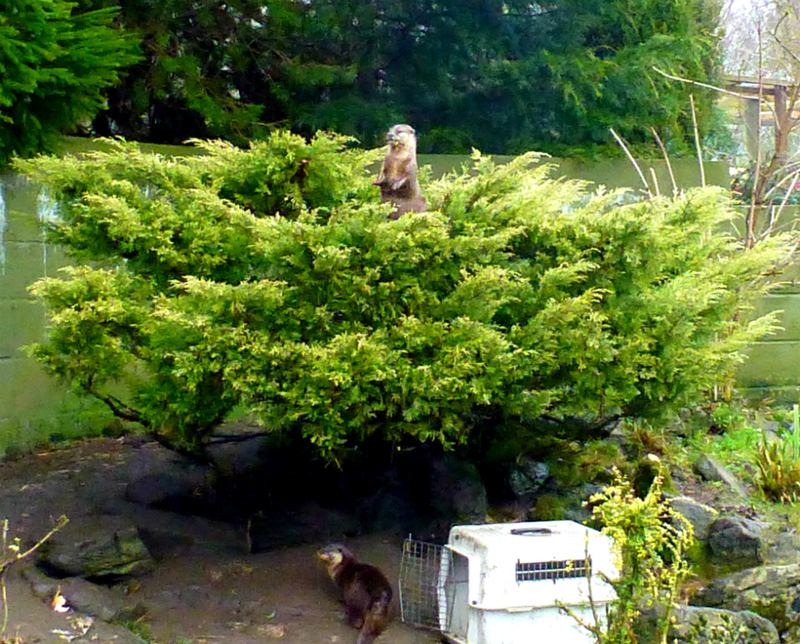 Until then, I hadn’t realised that otters could climb trees. Major renovations were being carried out at the zoo during our visit. 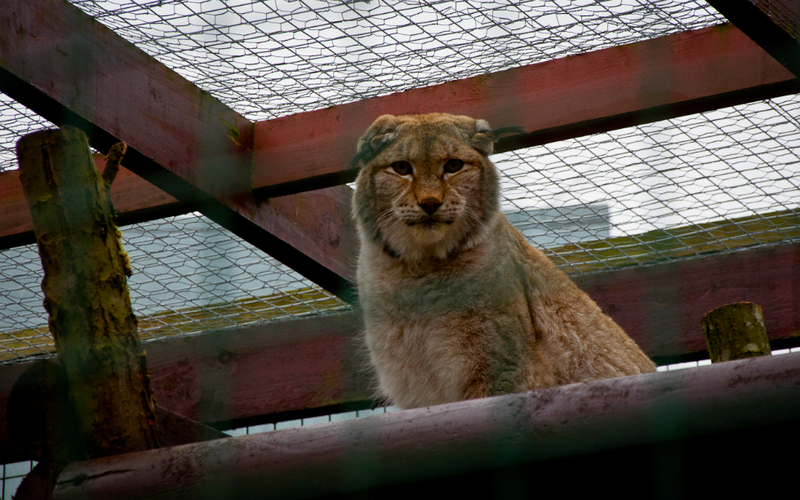 New and better enclosures were going up, but in the interim some animals were unavailable to view, and a lot of the housing had incongruous signage. We had each paid a little extra for a “handling session”, because who would pass up an opportunity like that? At the appointed time we made our way to the reptile house, and presently the head keeper appeared and began setting out chairs. The chairs were very, very small. As more visitors entered the building, we realised that everyone else waiting to handle the animals was half our height and a tenth of our age. A cluster of parents looked on proudly from behind a barrier as the four of us squatted on the tiny chairs among their infants. Head Keeper Lynn introduced us all to a python, a tortoise, and a giant hissing cockroach. 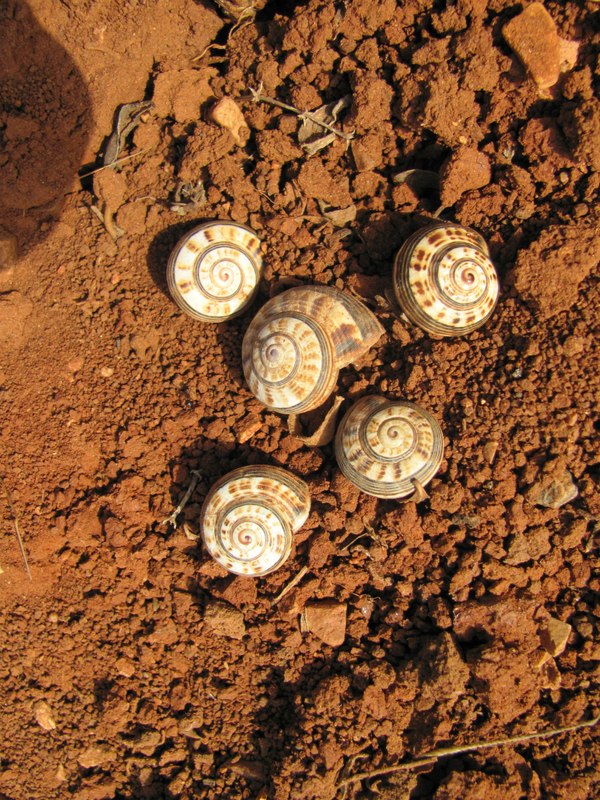 She gave a talk about each one – where it came from, its habitat and body structure, and how to hold it safely. 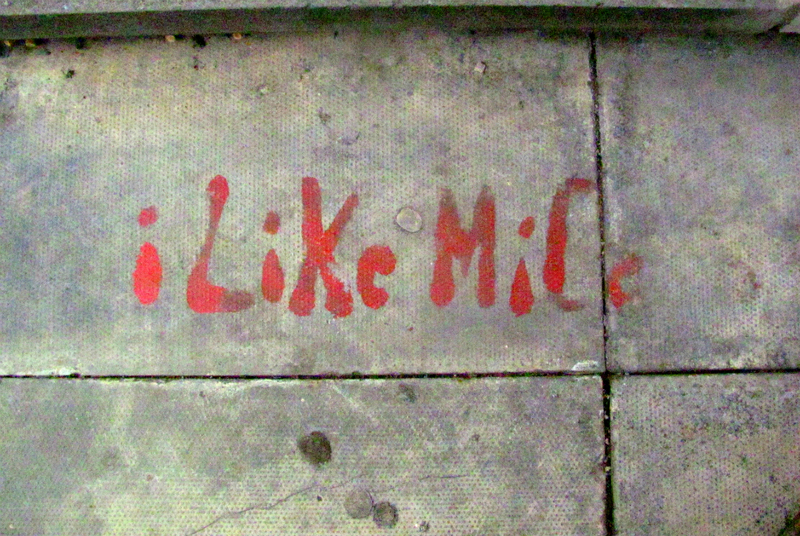 We listened meekly and did as we were told. Happily for the future of conservation and this blog, there are still many people who don’t grow out of it. For Bunty and me, the best part of visiting the zoo was that it didn’t have to end. We arrived home to our own zoo, which welcomed us back with a crescendo of squeaks and meows and grunts and binkies, the moment Bunty crackled a bag. 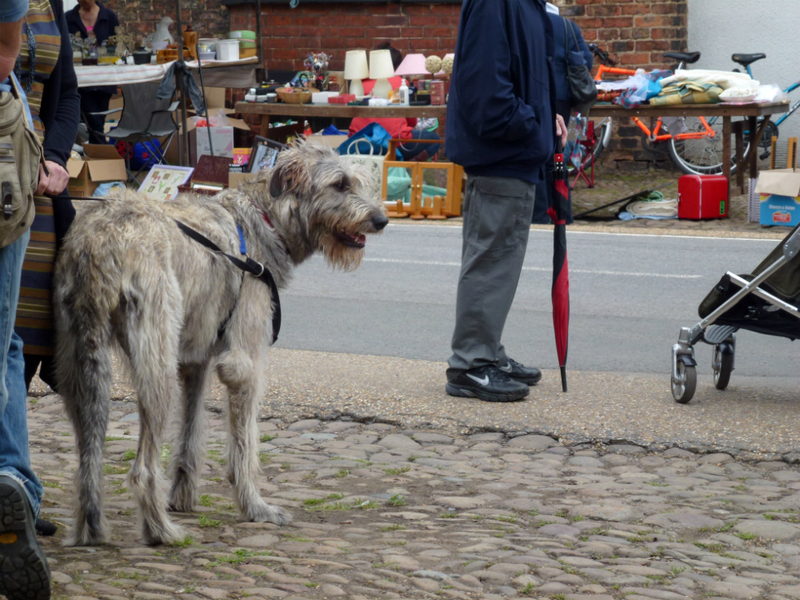 This is Tallulah the Irish Wolfhound, who is seven months old and the size of a small horse. I met her while I was staying with my Internet friend Lemongrass, who lives in a converted church in a village that seems too quaint to exist outside of a novel. 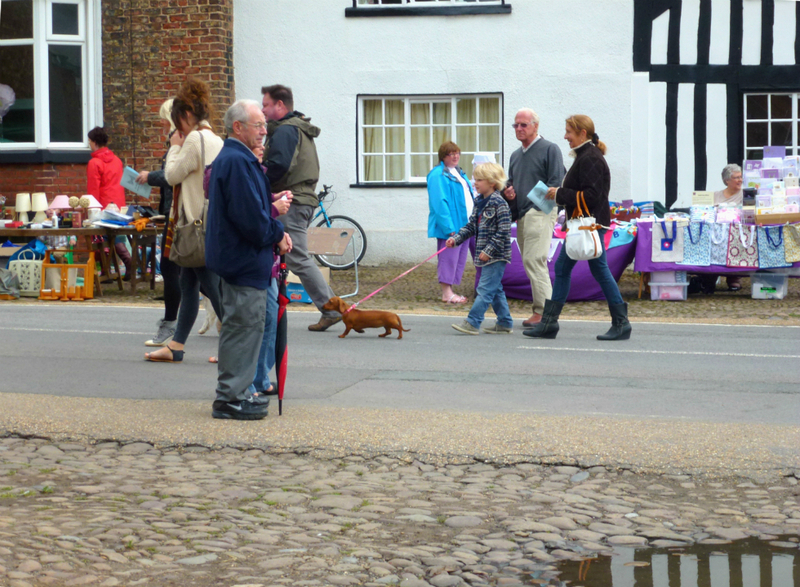 The cobbled high street was closed for its annual Hidden Gardens Fayre. 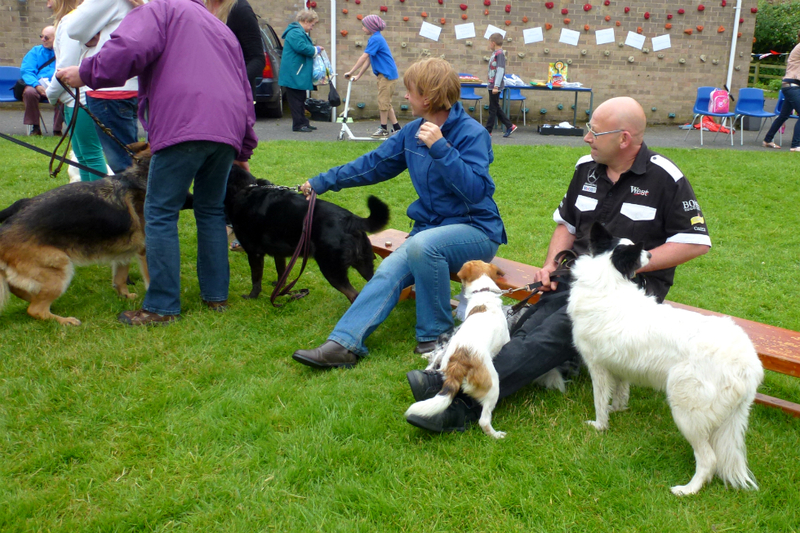 It was lined with stalls offering bric-a-brac, fairground games and baked goods for charity. A brass band marched between the puddles. The villagers had opened their gardens to the public, and among their herbaceous borders and goldfish ponds were ballet dancers, jazz musicians, jugglers, and trestles overflowing with strawberries and cream. Brollies opened and closed against the vagaries of the English Summer. This homeopathically-proportioned dachshund is called Darla. It’s that sort of village: all the dogs have posh names. Tallulah and Darla were on their way to the village dog show. 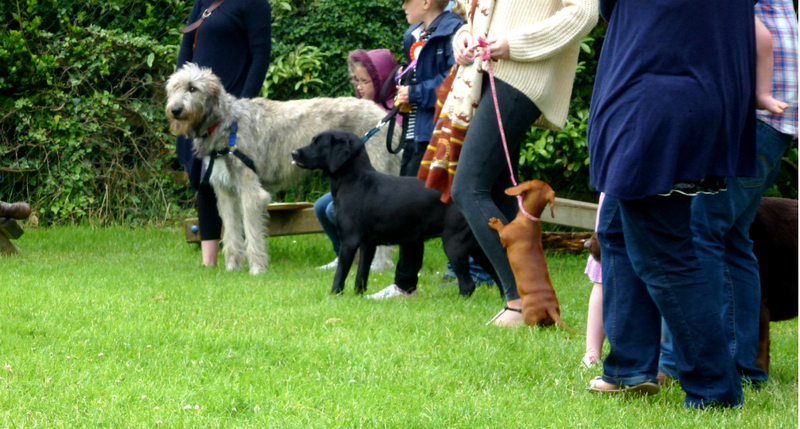 Having never attended a dog show before, I followed them with some excitement. My first impression was of chaos. 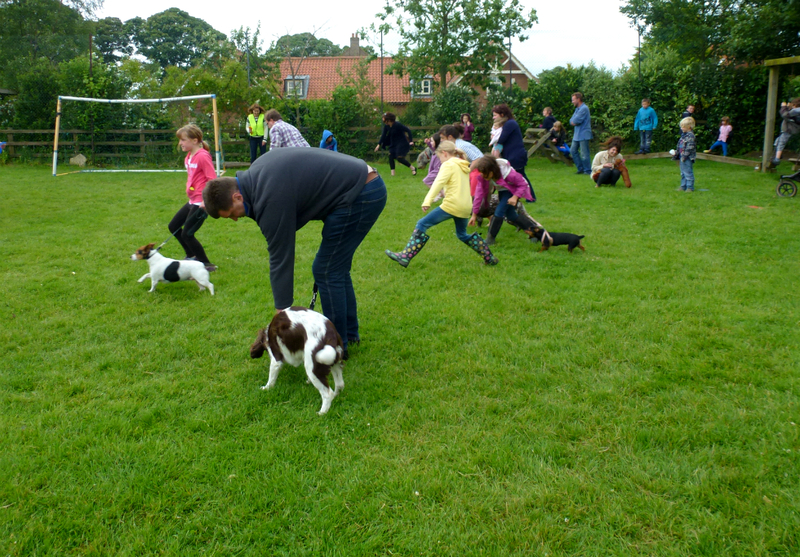 This couple below spent the whole event untangling their four dogs from everyone else’s, while their Jack Russell barked hysterically at the world at large. 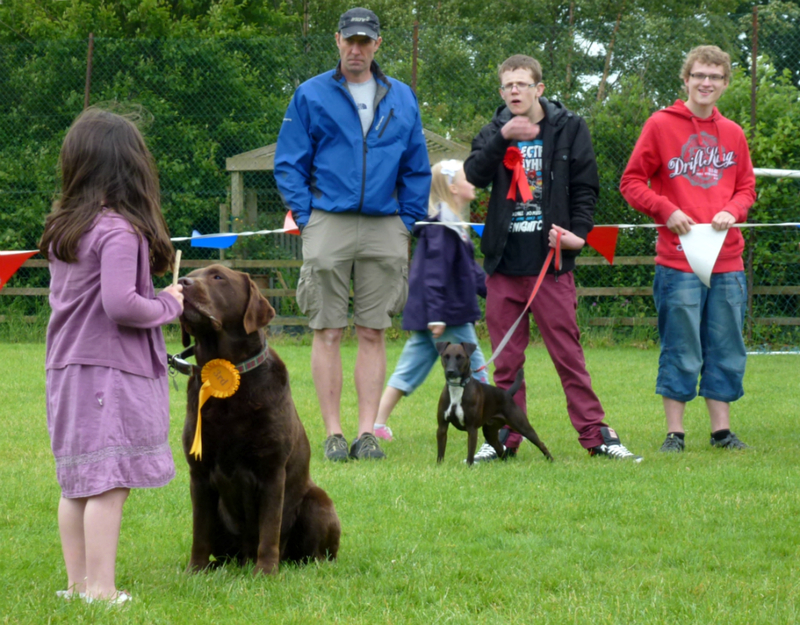 Inside the show-ring, these dogs were the most well-behaved. 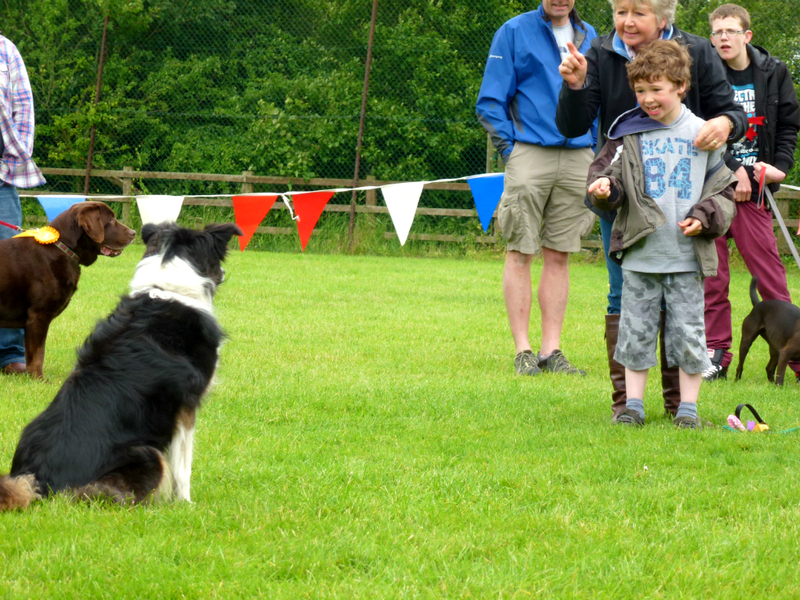 They won several rosettes, and the collie on the right won Best in Show. 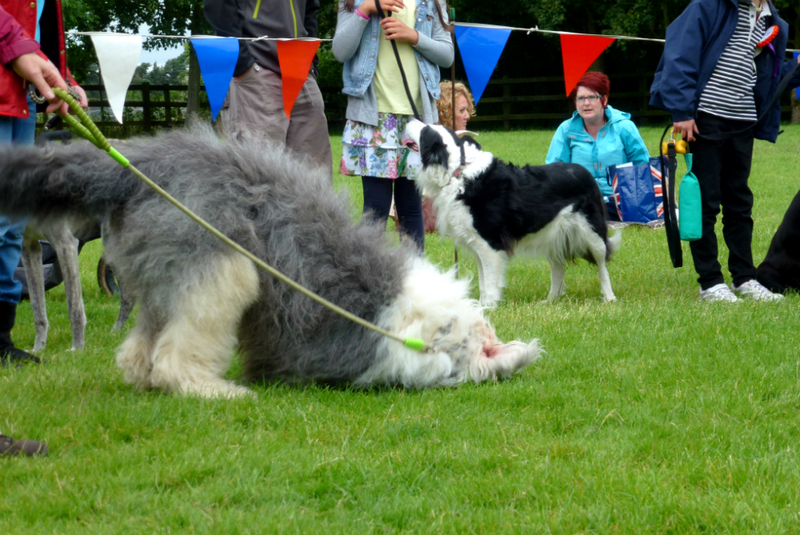 The blue marl collie under the man’s legs competed against Tallulah and Darla for Best Pedigree, and won. I loved that the show’s judging categories allowed for non-pedigrees too. Even the oldest, most fleabitten family mutt had his opportunity to shine. 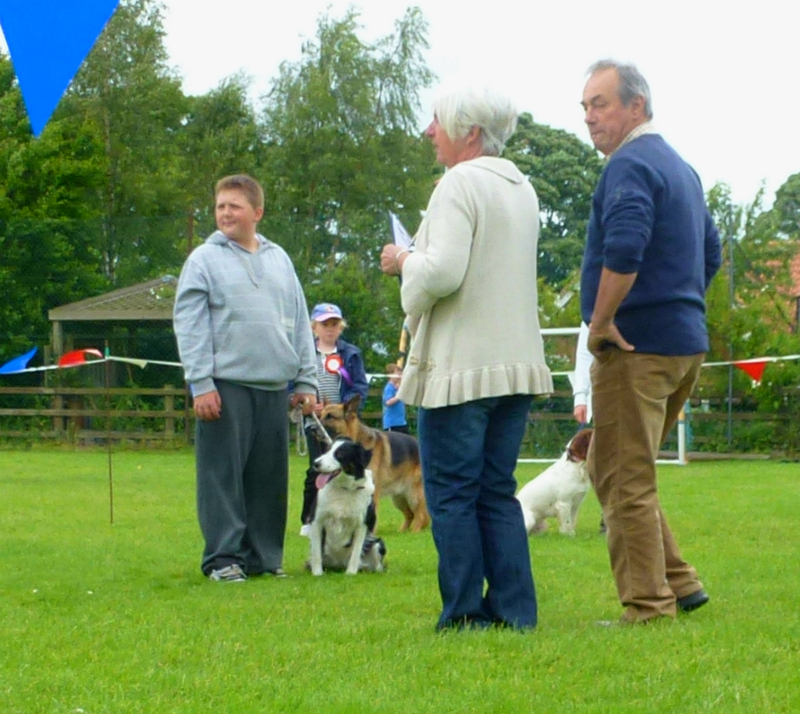 The category for Best Mongrel was called “Best Mixed-Breed”, because we don’t say the M-word, not in this village. My favourite competition was for Fastest Biscuit-Eater. Here they are lining up for their biscuit-eating race. The biscuits were laid down in lines leading away from each dog. I thought Tallulah would be a fast worker because of her size; on the other hand, Darla was closer to the ground and thus to the biscuits, which had sunk into the grass and were hard to see. There was a surge of total confusion. Most of the dogs did not know what the hell was going on, but got excited anyway. Some noticed the biscuits, though not necessarily their own biscuits, and ate them. Tallulah gallumphed to the far end of her line and ate her last biscuit. She was getting away from all the little yappy dogs, because, as her owner explained to me, a chihuahua had once verbally abused her. Darla wanted to be picked up because there were too many Irish wolfhounds around for her liking, so her human had to patiently pick up each biscuit and place it in Darla’s mouth. It wasn’t clear who won this contest, but we can rest assured that all the biscuits got eaten by the end. In case you are thinking I am still in the Sahara, I had better start by saying I am not, and I haven’t even been kidnapped by nomads – I suppose I wasn’t their type. Also, I didn’t steal that camel in the end. 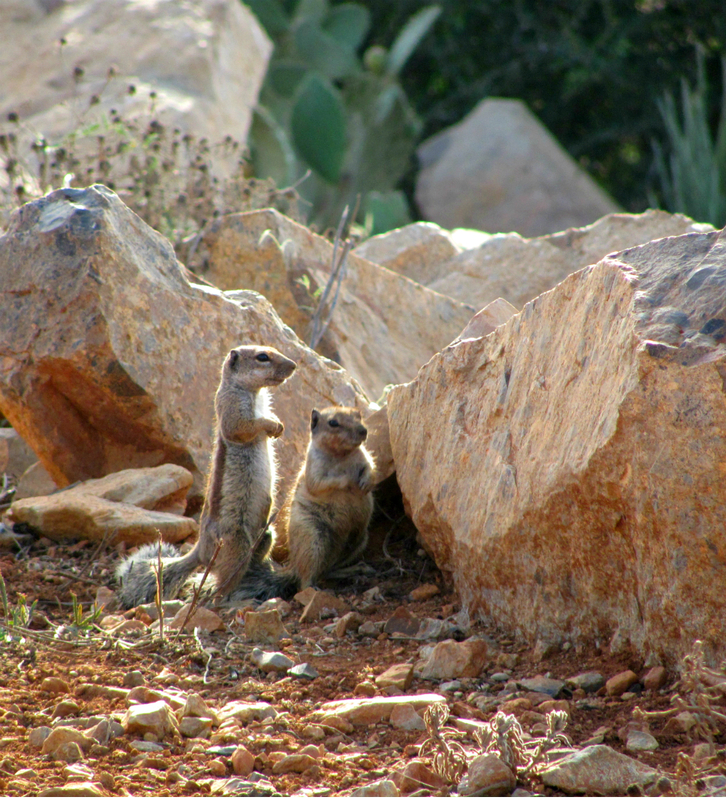 There have been numerous animal-related adventures since I last blogged, but I have not had an opportunity to write about them, because – to my great delight – I have embarked on a zoology degree. This is what has been taking up all of my time since I returned to Scotland. 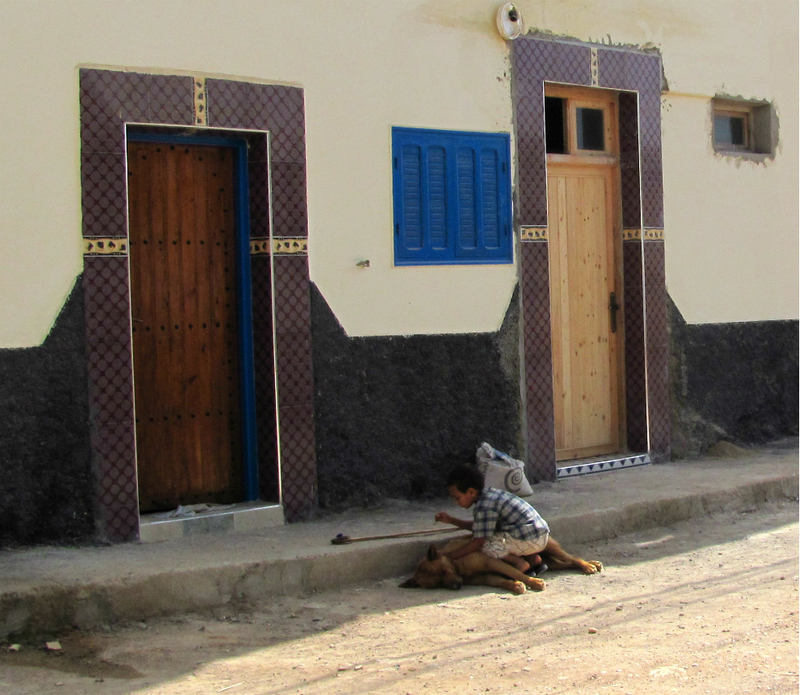 Here’s a photographic catch-up of our Moroccan sojourn. 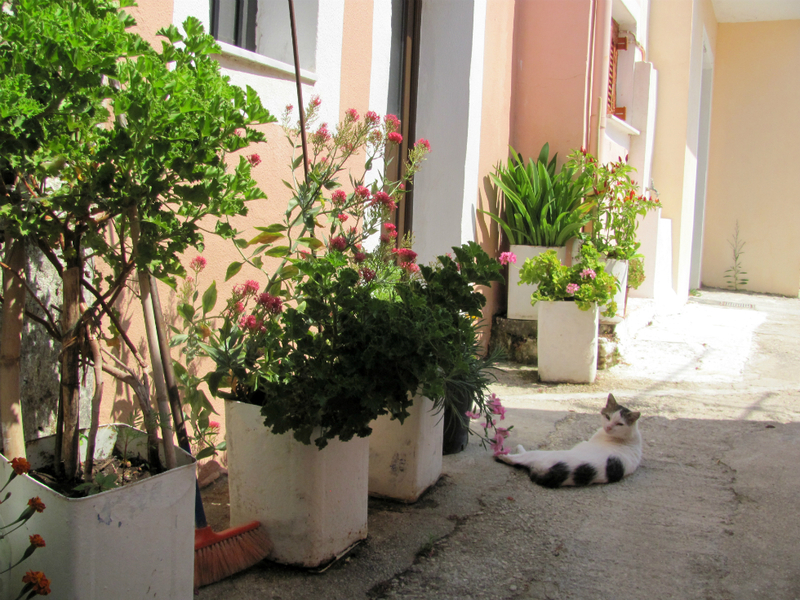 After Morocco, I went by myself to the Greek island of Corfu, to visit my father and stepmother. 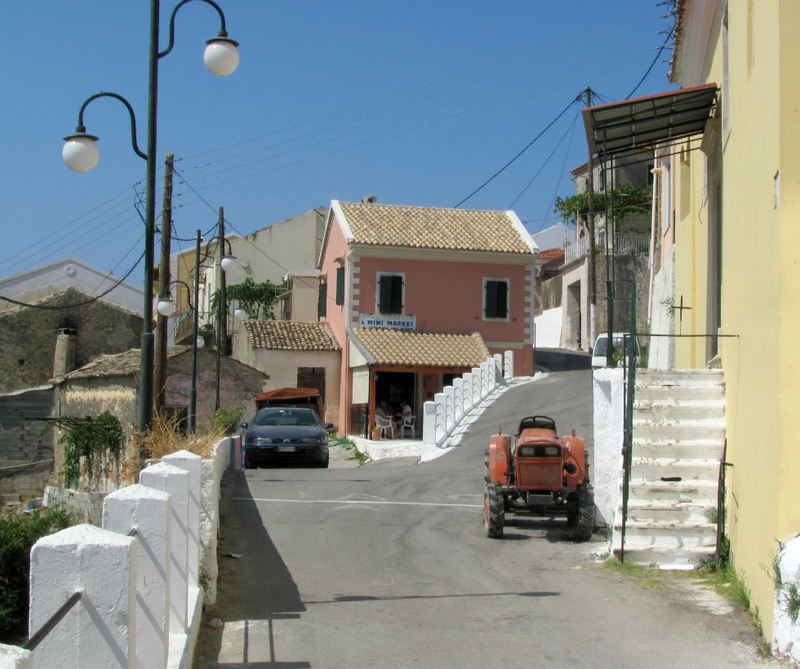 They live in a hill village surrounded by ancient olive groves, and their internet connection is not ideal for blogging. It was lovely to see my family this summer, but it was also lovely to get home and be greeted by all the furries at our wee cottage. They had been well looked after, but even so, the rabbit and cats came crowding round me with enthusiasm and affection when they saw me. The guinea pigs greeted me by clamouring noisily for food. Based in Scotland, my boyfriend Bunty and I open our door to unwanted pets and try to enrich their lives with freedom and wonder. The upshot is that we are greeted every morning by butts in our faces, ripped wallpaper, and an ear-splitting cacophony of demands for breakfast. That means they love us, right? I was Bitten by a Snake! What's a nice bug like you doing in a place like this...?. A diary of my ringing activities in the United Kingdom along with a few of my wildlife adventures! Our little farm in Skagit county. Parrots, cats, and my little world. 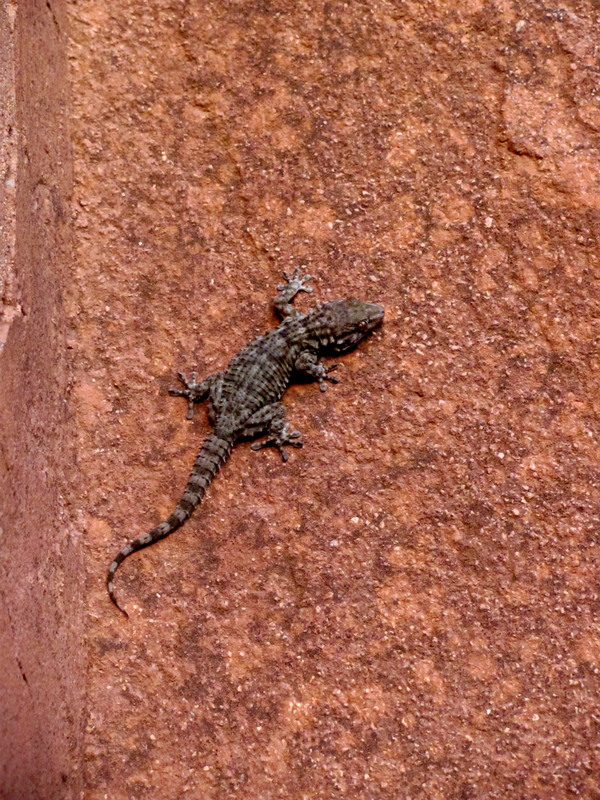 Adventures in lizard-chasing, bird-watching and litter-collecting. Life as it revolves around two kitties. Just wife’n it up South Dakota-style! 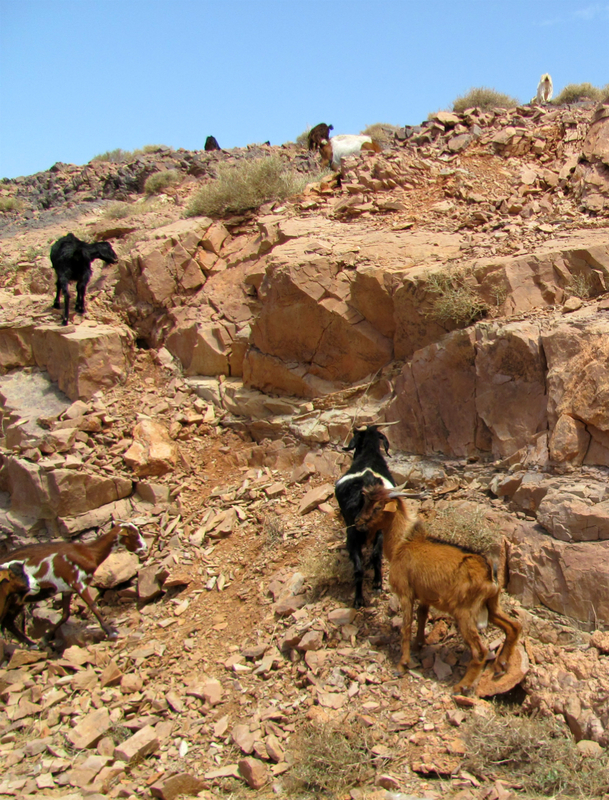 Wildlife, in a variety of weird and wonderful locations. Wildlife of the UK’s gardens and countryside.